Samuel: You wanna play against me? You have no chance. Your gift is not strong enough! Ediciones Musicales BMG Ariola S.A. EXTRAORDINARY POWERS OR A LEAP OF FAITH ? 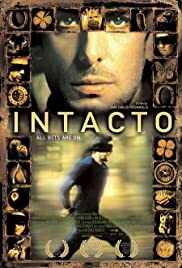 INTACTO (INTACT) is the story of a group of `gamblers' whose ultimate bet is their own life (or others peoples life). Sam (Max Von Sydow) a Jewish only survivor of a concentration camp, runs a high class Hotel / Casino in the in a volcanic island. There; while normal people use money, others come to bet their possessions (which are not money) against Sam's wealth (the casino and other `things' he won over the years). The game, Russian roulette, one empty chamber, the challenger shoots first. Sam's protégé, Federico, concerned that Sam may someday lost, and moved by his own ambition, decides to go against him, but to avoid the confrontation, Sam `de-activate' Federico. At this point you are probably questioning about what I am writing; well, basically these characters can control LUCK. Yes, they have plenty and are able to steal others people luck and use it for their own profit or as a possession to bet against others. 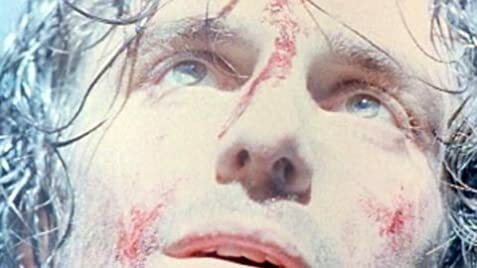 Federico is no longer able to control luck; so he must find his own protégé to play against Sam, and finds Tomas, a fugitive (only survivor of a plane crash) whose only interest is to run away. Three other characters emerge: a police woman, a bull fighter and Tomas ex-girlfriend; everyone is a part of the destiny of the others. Harry Potter is nowhere around; there are no WIZARDS or enchantments. If you ever knew a gambler, you probably heard about their eccentricities, like do not touch them, do not take pictures a some other things many people believe and many others are afraid to confront. The basic principle of atheism is that men control their own destiny; and that is precisely the question here. All these people believe in themselves; they are their own God, but also when their faith is lost, also are their powers. Are there really powers ?. The answer of these questions is absolutely metaphysical because faith in itself has no logical explanation. Fresnadillo's movie is not for everyone. There are no likable heroes (every character is moved by selfishness or ambition), and the premise is absolutely about religion and nothing about the material world (even when seems the contrary). At about two hours, the pace is more European than American and are not quite clear, but none of these things are faults, is just a matter of taste. There are also very intense and interesting scenes like the run in the forest, that will take out your breath. If you are out for something unconventional, give it a try. It is an interesting game.